The Alvin Pneumatic-Lift Stool is a versatile and functional stool that provides a drafting height seating. Featuring a pneumatic height control, it has adjustable height of 18 inches up to 26 inches, perfect for home and office work area. To provide convenience and comfort even with long hours of use, it comes with swivel feature. 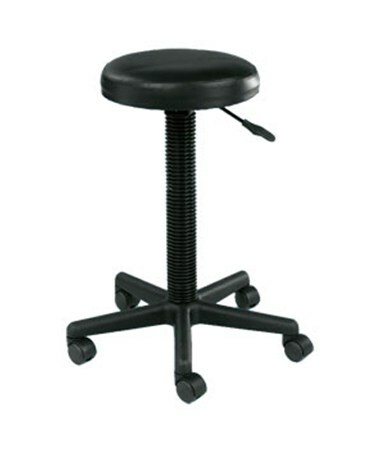 This black pneumatic-lift stool has a 13-inch diameter seat that is made of extra soft molded foam. Its 22-inch diameter five-star base ensures maximum stability. With hooded casters that allow total mobility and easy control, this stool is flexible for all drawing and drafting needs. The Alvin Pneumatic-Lift Stool is puncture-resistant with its durable polyurethane material. It is easy to clean and requires no maintenance.